‘Bye bye’ UltraBaby said as I wandered down to the back of St Pauls Cathedral and the start line of the City of London mile. I’d accidentally put myself forward for the 5mins 30secs club but post Skye my feet have been playing up with bruising, bleeding and generally not being very useful. So when I ran into Ben (the beardy one offa Twitter) who was starting a wave behind me I was a little bit worried. The truth was I’d only run about 3 times since Skye and none of that had gone very well. Still I was at the very least well rested. I stood nervously at the back of the pack and when the start came I pushed as hard as my little feet would carry me. I’d chosen for the race my Altra Instinct which in all honesty are not noted for their speed – I had wanted to use my On running shoes but my feet were a bloody, nasty mess and I required the soft, extra wide, cushioned feel of the Altra to even get going. I realised about halfway I was losing ground on the front of the pack but I also wasn’t at the back – clearly others had also over-egged their ability but at the turn I still felt okay and as I came up to the 400 metres to go sign I hit the afterburner and put my mid-race slump behind me. At 200 metres to go I could feel the power of the crowd behind me and my arms pumped hard to cross the line in a little over 6 minutes – not my best time at the distance, not even close but I’d enjoyed it. 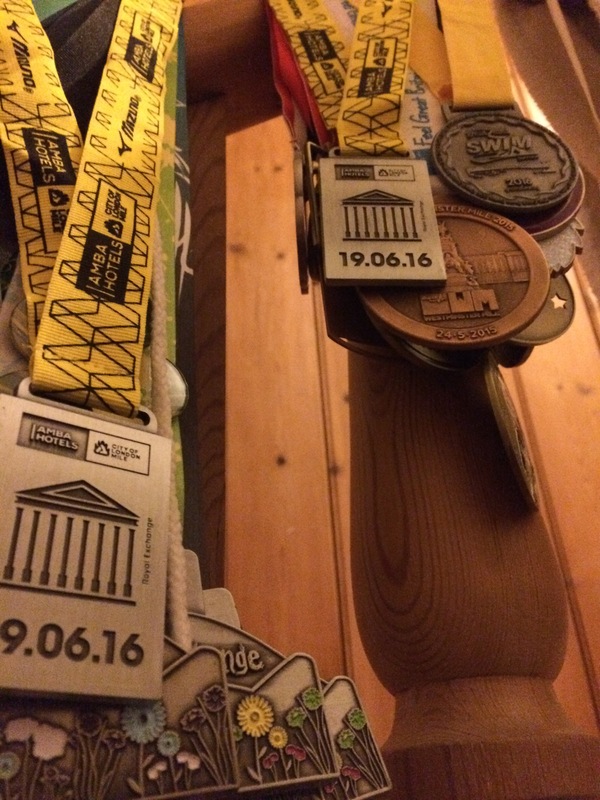 The route took in the Bank of England and St Paul’s Cathedral so it was familiar territory and I knew this would be harder than the Westminster Mile but in the end I’d just had a nice time and an opportunity to run without a race vest or hydration. There were other benefits – I did get to say hello and see running Gemma Hockett who is as exceptional a runner as her social media suggests and I picked up a very nice medal for my efforts but there was something else – the GingaNinja was back for a raceday. The GN had signed up for one of the last waves, clearly I had bullied her into taking part but it was a nice day and I felt she’d appreciate taking part in something with such a tremendous atmosphere. The problem was that UltraBaby was feeling a little clingy. We hatched a plan, a simple plan, move the GN to the ‘family wave’ and she could then run with UB who would walk/run as much of the distance as possible and then I’d take her off the course to follow in the buggy along the route shouting support. With approval of the plan from the organisers we got UB warmed as she ran up and down the street, carb loaded and did a bit of stretching (of her very loud lungs). Then problem two kicked in – UB fell asleep. Some quick thinking saw me remove the timing chip from my race number and join in the family wave with the GN and the buggy containing the baby. 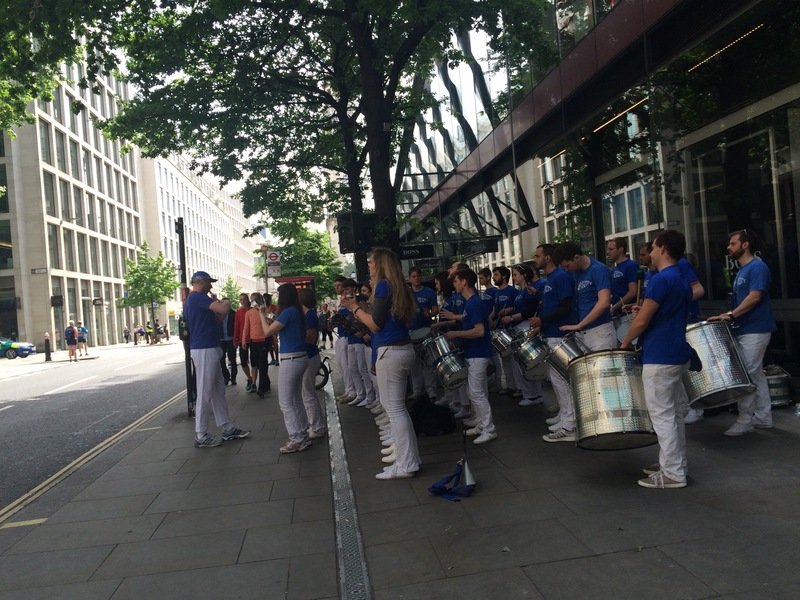 For a second time I prepared for the off and this time I enjoyed the ambience of the event, sedately running through the City of London, waving at children, taking in the Steel Drum Band and generally having a lovely time. The GN in her first run in ages and her first race in even longer powered home the last few hundred metres and was greeted warmly by the excellent volunteers who handed her and UB medals. Great work, especially just a day after completing the Great East Swim. The Amba City of London Mile (and the Westminster Mile) is a truly great event run in the spring and having done it, I can recommend it (and its Westminster sibling). It’s a ball breaking distance, the mile and one you can really put your foot to the floor with but the sense of achievement is huge regardless of your actual running ability. I love the mile, its my favourite race distance after the 10 mile. 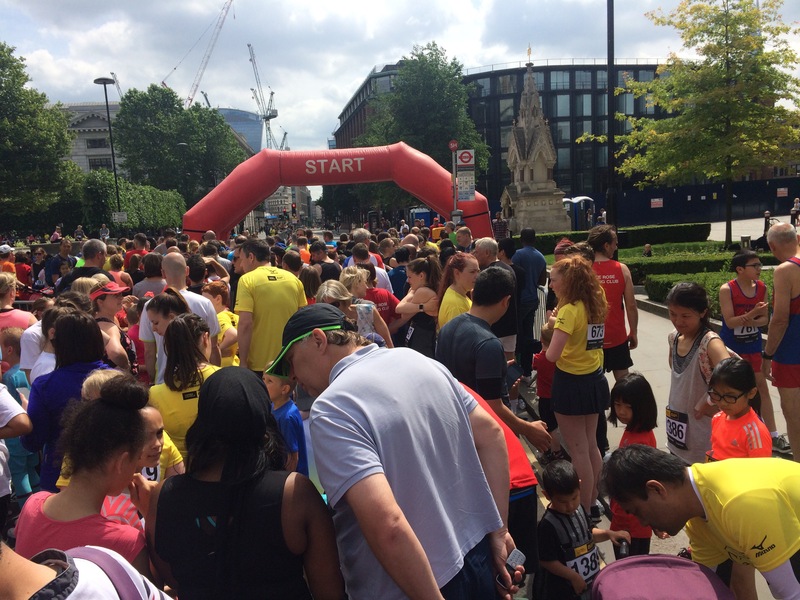 The City Mile is incredibly well organised coupled with a great route and a stunning atmosphere, its unbeatable. if you’re looking for a community event next year that can draw people together then this would be my recommendation (along with the Westminster Mile). As a final note I think a great deal of goodwill should be shown to Amba Hotels who sponsor the event and help to make it a free to enter race. Without organisations like them events like this simply wouldn’t be possible. Anyway, don’t delay get training – you’ve got a whole year before the next running! and most importantly get involved!